Rihanna shared a pic of her having some fun last night. Thanks to her best friend Leandra’s Instagram photo, we can see a better shot of Rih’s shirt. 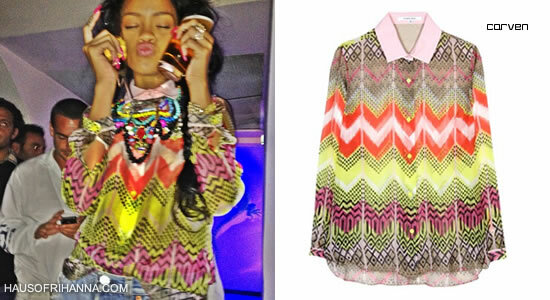 Rihanna is wearing a printed button-down shirt from Carven‘s Spring/Summer 2012 collection. The brightly-coloured silk top is available at MyTheresa.